There is much tradition associated with pipe smoking that dates back centuries ago. The traditions are part of the lure of pipe smoking for many people. In more recent times however, some of the traditions have evolved and been modernized, mixed and matched, new and old. Here is a story of the newest innovation in pipe stands as told by Cam Schutte. 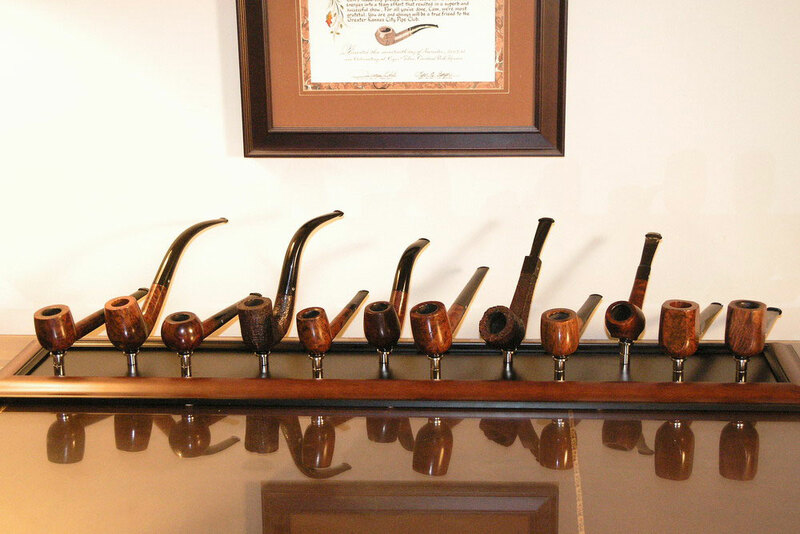 Cam is a member of the Greater Kansas City Pipe Club and The United Pipe Clubs of America. It all started when Anthony Harris, member of our club and wood-turner "par excellence", decided to combine rare earth magnets with his exotic wood creations. His principle is simple and very effective - embed a magnet in the core of the pipe stand and use a spherical magnet in a pipe to hold it in place n the stand. Attachment 1 is the one he created for me to use as a prop for photographing pipes. Anthony has offered his stands at several shows including St. Louis, Chicago and Kansas City. They have been very well received with notables such as Chuck Stanion and Jon Rinaldi acquiring them for their photography as well. But with a substantial collection of large Comoy’s Extraordinaire 800’s to display, I wanted more from this intriguing technology. I just didn’t know what the solution might be. The answer came during a brainstorming session with my good friends, Mike Sull and Al Shinogle, on our way to the Chicago show last May. I took my single pipe stand to show Al as he had not seen one. Being a very resourceful fellow who loves to create unique items in his extensive workshop, Al quickly began offering mind expanding ideas for how the magnet technology might be employed for a collection of pipes. By the end of the trip we had settled on a concept of using a steel plate as a base for a stand with more capacity. Attached to it would be cylindrical posts with magnets at each end. One end would attach to the plate and the other would hold a pipe much in keeping with what Anthony had created. Soon after our return home, I began working on a prototype. As I tried different materials for the posts, beginning with vulcanite rod, I found it outside of my mechanical skill set to make anything work well enough to accomplish the needed result. I consulted with Anthony but no apparent solution surfaced from that conversation. One day, out of the blue, it came to me that no other material was needed but the magnets! With cylindrical magnets (1/2" in diameter and 1/2" high) I could assemble posts as high as I needed by stacking them. And with their pulling power, staying adhered to the plate was no problem. The next issue was how to get the pipe to rest securely on the 1/2" post. Again, necessity was the mother of invention, and I found that putting a 3/4" disk magnet 1/8" thick on the top of the post gave a lot much more adequate support. But one obstacle remained - how to get the cup-like effect of the depression Anthony made in his stands. I decided to walk the aisles of WalMart to see what inspiration I might find. Then it happened - I saw buttons, simple plastic buttons for clothing. Fastening one of those to the disk magnet with a strong cement did the trick. With the functionality resolved, the finishing touch was to have a frame made that would contain the steel plate and give the appearance of a piece of furniture. This 36" creation now resides on the antique desk in my office. It magnificently displays 12 of my large Comoy’s as I had envisioned. Cam does a lot of good things in the pipe community for which he goes unrecognized. He was a first year member of the GKCPC and has served in numerous official capacities for that organization. He is currently an officer in the UPCA. He also has helped a number of organizations get their websites built using the Wild Apricot product. Specifically he is the webmaster for UPCA and the GKCPC. Any club wanting to create a website quickly and at a reasonable price couldn’t go wrong by contacting Cam. Interesting, but I wonder what the bottom of the pipe looks like? Nicely done Cam, makes for a simple but effective display. Would you care to share some info on the magnets that you used, such as the material, grade or pull force. Also, are you using a spherical magnet inside the bowl or just a ball bearing. Thanks and again, nice, nice execution on that! I also would like more information on the magnet parts. This is an amazingly simple and yet effective design! I am just planning out a 10-pipe rack and this has stopped me cold. Rare earth magnets can be purchased from many sources, here is one. I use one on my oil pan plugs. They only come off when pulled, and it takes some effort. I’d worry a little removing stain and/or leaving a mark on the contact surface of the pipe. Don’t forget that Vauen has been manufacturing pipe stands that work exactly the same way for years before you file the patent. I, too, have made these stands for years. To answer the questions, the ball inside the pipe bowl has to be a magnetic sphere. 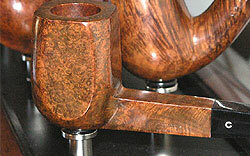 Around 3/8″ diameter is good for most pipe bowls. A ball bearing won’t work, even on a thin- bottomed pipe. But with even a 1/8″ thick rare earth disk magnet, plenty of pull is generated between the two to sufficiently hold a pipe in place. They tend to make diamond-shanked pipes lean, too. So bear that in mind. Cam: What size magnetic sphere did you use for drop-into the pipe bowl? Thanks Classicgeek. I was afraid you were going to say 1/2″, I ordered some 3/8″ and I don’t think they are going to work. 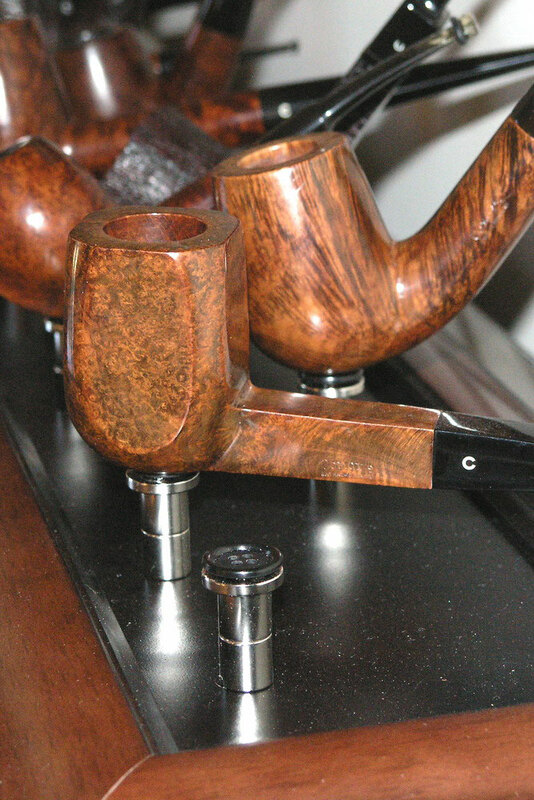 Boy, those little suckers are pricey, I need enough to mount 20 pipes…. If you’ve ordered them, there’s nothing to do but wait and see, right? Personally, I think they will work. The 1/2″ ones I have are unbelievably strong, and I think the point of them being spherical is so they can nestle down in the bottom of the bowl as close to the base as possible, and able to rotate their poles to align with the base. The 3/8″ will do the job. 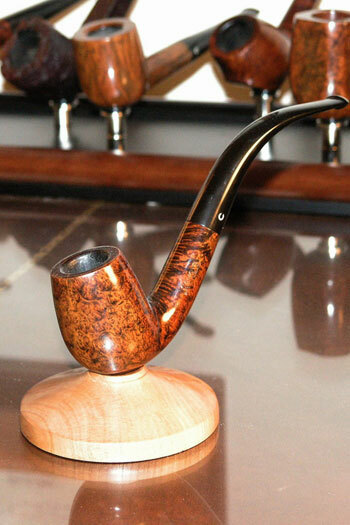 Maybe if you have some really strange pipes like freehands where there’s a lot of briar between the base and the sphere, you might wish for more, but for most pipes 3/8″ spheres will probably work. I only had trouble with a churchwarden and a pipe that was designed as a sitter whose shape didn’t line up with the magnetic lines of force. But once I put the ring (button in the design above, I used large washers) on the base, even those sit up just fine. How about a shot of your stand? I’ll use the 3/8″ balls for my smaller pipes. I have a few XL pipes, all classic shapes that will probably require the 1/2″ spheres. I could drop a few 3/8″ I guess, that should help. Be a great idea to use this magnetic structure on a wall system. I have 26 pipes and I’m not done yet. So having pipe rests all over the house isn’t going to get it. Some of the pipe stands sold today are crap. The pipes fall out. I’ve decided to make my own pipe structure custom made to each pipe. The one size fits all is a bad idea for my situation. I have large pipes and small pipes that just need their own spot. I’m a retired Machinist so, I can make just about anything. Machinery permitting. Should be fun making the molds. My summer project. Reminds me quite a bit of the Magnacob. Can anyone offer their insights on how to mount the base so that the pipes are secure and that they form a nice looking display?